Beheaded for Christ, the glory of the Sun. Coupling blood with the priesthood. Carrying Alexander from this life. 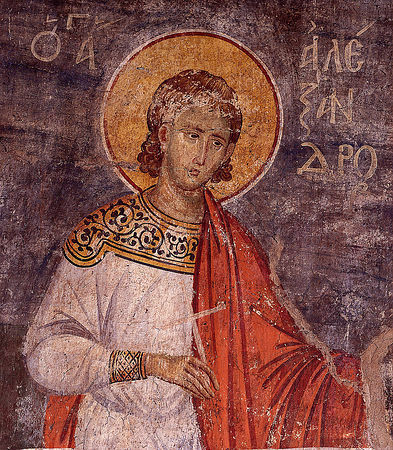 The Holy Martyr Alexander was from Carthage, but some maintain that he came from Puteoli of Italy. When he came of age he became a soldier and served in the regiment of the tribune Tiberian at Rome. When he was eighteen, the Roman Emperor Maximian Hercules (286-305) issued an edict that all citizens were to go to the temple of Jupiter outside the city on a designated day to offer sacrifice. The tribune Tiberian assembled his soldiers and he ordered them to go to this festival, but Alexander, raised from childhood in the Christian Faith, refused and said that he would not offer sacrifice to demons. Tiberian reported to the Emperor Maximian that there was a soldier in his regiment who was a Christian. Soldiers were immediately sent to arrest Alexander. Standing before Maximian, Alexander boldly confessed his faith in Christ and he refused to worship the idols. He said that he was not afraid of the emperor, nor of his threats. The emperor tried to persuade the young man with promises of honors, but Alexander remained steadfast in his confession, and denounced the emperor and all the pagans. And like the Protomartyr Stephen, he looked up and beheld the Lord Jesus at the right hand of the Heavenly Father. Maximian remanded Alexander to the tribune Tiberian, who was being sent to Thrace to persecute Christians there. Tiberian had Alexander hung by his fingertips with a heavy stone attached to his feet, then he tied him to a wooden pole and had him flogged without mercy, followed by his flesh being flayed. After these barbaric torments, they transferred the Martyr to Marcianopolis of Thrace, fettered in chains. At this time an Angel told Alexander’s mother, Pimenia, of her son’s martyrdom, and she accompanied him and gave him encouragement. Along the way Alexander was subject to diverse punishments, while he kept a complete fast for forty days. In the city of Philippopolis, Tiberian retried Alexander in the presence of the city dignitaries gathered for this event. At this trial Alexander remained steadfast. In the city of Drizipara, Tiberian imposed the death sentence on the Saint. The holy Martyr gave thanks to the Lord for giving him the strength to endure all the torments, and to accept martyrdom. 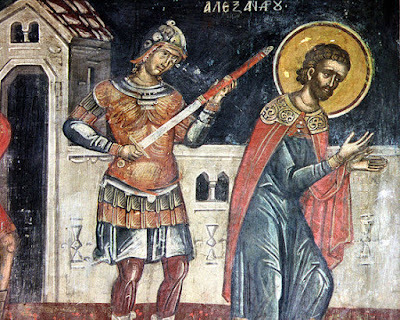 The soldier who was supposed to carry out the execution asked the Saint’s forgiveness, and for a long time he could not bring himself to raise his sword, for he saw angels waiting to take the soul of the Martyr. The Saint prayed and asked God to remove the angels, since he wanted to go to the Lord. Only then did he cut off the Saint’s holy head. The Saint’s body was cast into a river, but it was retrieved by four Christians. Pimenia took up the remains of her martyred son and reverently buried them near the River Ergina. Healings began to take place at the grave of Saint Alexander. Soon the holy Martyr appeared to his mother in a dream, in which he comforted her and said that soon she too would be transported to the heavenly habitations. Over his tomb a basilica was later built. In 591, the Khakan of the Avars captured the city. He burned the basilica and destroyed the relics of the Martyr in looting their silver casing. It should be mentioned that the main feast of the Saint in the Greek synaxaria is February 25th, while in Slavic synaxaria it is May 13th. However, in Greek synaxaria on May 13th a martyr known as Saint Alexander the Bishop of Tiberian is honored, though there are no details about his life, yet he is given Iambic Verses. It is believed that over the course of the centuries there was some confusion, and Saint Alexander's commemoration became confused so that a made up episcopal see of Tiberian was substituted with the name of the tribune Tiberian. 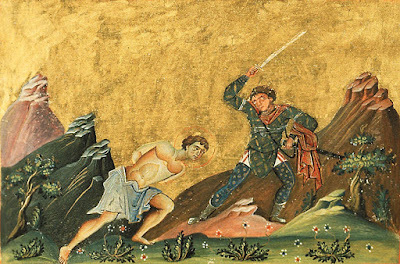 To add to the confusion, on May 14th in the Greek synaxaria there is commemorated a martyr known as Saint Alexander, who was martyred in Kentoukellai, which is an unknown place. The biography of the latter is very similar to the Saint Alexander commemorated on February 25th, though given more detail. Therefore he is in reality commemorated on all three days in the Greek synaxaria, but only on one day in the Slavic synaxaria, the only common day being May 13th. Portions of his relics are said to be in the Monastery of Saint Seraphim of Sarov in Pistoia of Italy.